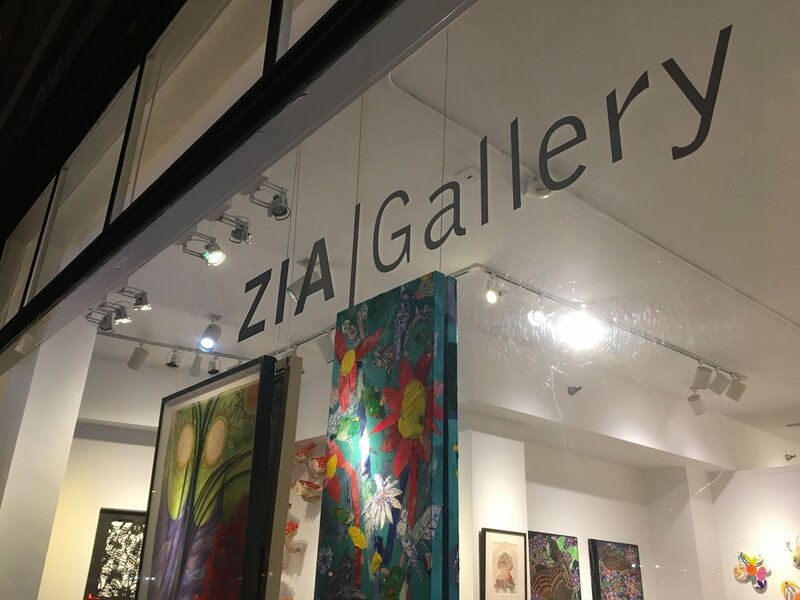 The exhibition “The Floral Show (not what you expect)” is in full swing at ZIA Gallery, bringing together artists of such talents and imagination evoking the wonder of our natural world. This exhibition follows “The Elephant in the Room” which centered on elephants in art. Now artists soar toward spring with uplifting color and invention derived from inspiration of flowering plants. The late scientist and essayist Loren Eiseley revitalizes appreciation through his essay “How Flowers Changed the World.” The journey of flowering plants resulted, no less, in the emergence of us. Angiospems have developed such remarkable diversity of form, color and mechanisms to travel. Yet, we still have much to discover, learn, and to rouse our curiosity. Visual artists, too, through flourishing creativity, re-energize the words “floral show.” They are stimulated and fascinated both directly and indirectly, as can be seen through the unexpected universes of Mary Burke, Melissa Jay Craig, Lisa A. Frank, Karina Noel Hean, Anne Hughes, Ted Preuss, Jonathan Ricci, Fumiko Toda, John Vlahakis, Carl Wilen and invited artists Kevin Veara and Phil Ponce. The exhibition includes beautifully executed artwork by guest artist Phil Ponce (host of WTTW’s Chicago Tonight) who takes inspiration from the traditional Mexican folk art technique of papel picado. To create his interconnected labyrinths of nature, Phil replaces tissue paper with durable black tyvek and represents insects native to Illinois – an ecosystem of plants and insects. 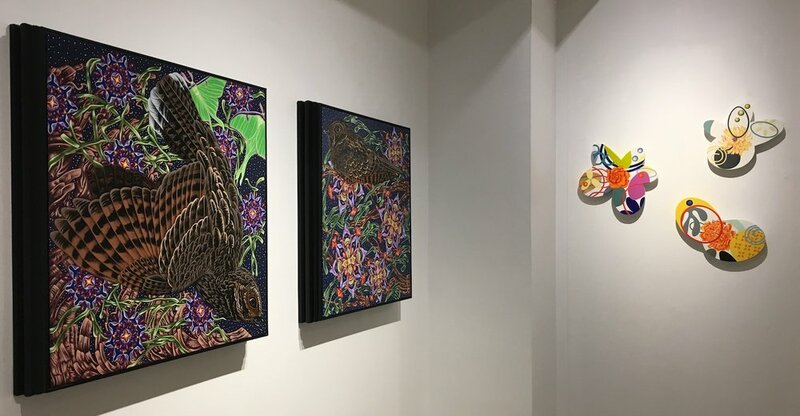 Kevin Veara’s visual ecosystem combines unusually patterned birds, flowers and insects in striking scale and color combinations. Melissa Jay Craig contributes her amazingly inventive handmade paper sculptural pieces, some inspired by looking at the lacy cellular patterns of a stem such as Bloodroot, others by seeds. Melissa Jay Craig’s “Protector” -only Melissa could create such a sculpture! There is always a twist (or two or three) in her thought-provoking pieces. 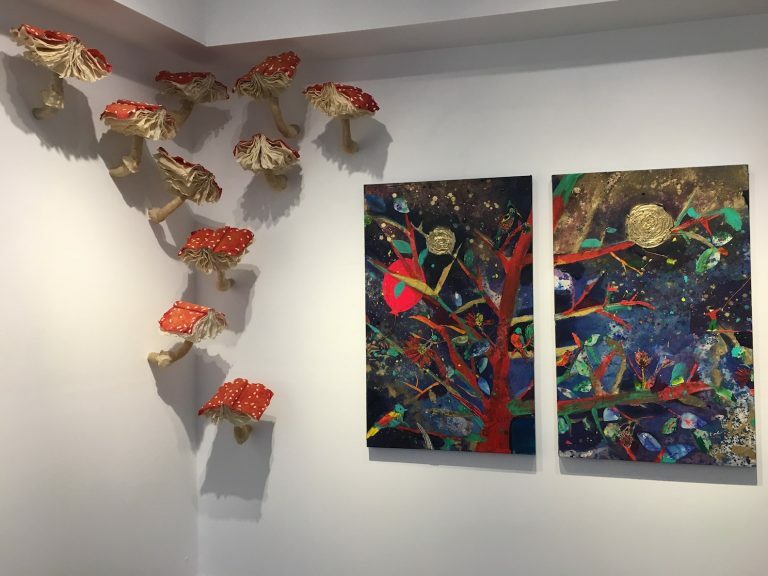 Her installation of (S)edition, sculptural book/mushrooms, growing up the gallery wall projects a sense of humor with much to engage and challenge. John Vlahakis photograph “Blue Velvet” mesmerizes as it saturates the eye with blue and yellow. Through his fanciful “Botanical 1: Spike and Alice” New Jersey artist Jonathan Ricci makes reference to the excitement surrounding a Chicago Botanic Gardens’ phenomenon that turned into an amusing story. Mary Burke’s paintings reveal her love of nature where blooms are often the only representational elements of her abstractions. Lisa Frank’s Frank In the Shadow of Butterflies 40 x 40. Lisa A. Frank uses her skill at layering her digital photographs to create lush compositions, while Fumiko Toda dazzles with mixed-media paintings. She holds dear childhood explorations in nature, growing up in Japan. Blue Sky II part of a diptych by Fumiko Toda, 48 x 30. Through choice of materials, color and expression, Fumiko’s paintings evoke that curiosity of a child on an adventure of discovery in the wide out of doors. Ted Preuss prints using platinum palladium on vellum for his “Vase.” More features to be seen! Ted Preuss uses historic photographic techniques on subtle imagery with new methods of presentation. Carl Wilen has often mentioned the fascination of flowers which he enjoys finding reason to include in his detailed wry, surreal paintings. 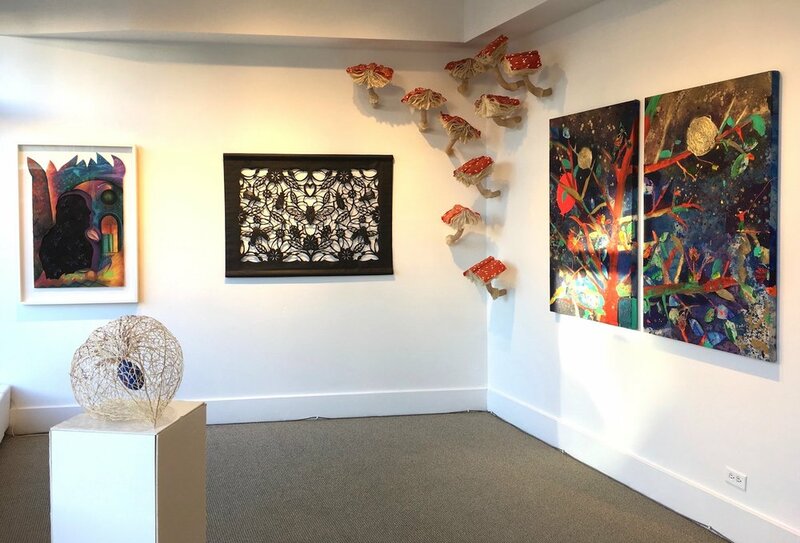 The Floral Show – not what you expect runs through April 7, 2018 at ZIA Gallery, 548 Chestnut St., Winnetka, IL.